Goodies for 2013 Toyota Fortuner SUV! Toyota Kirloskar Motors has big plans for Fortuner lovers! The official announcement of the new 2013 Toyota Fortuner is round the corner. And what is more interesting is that the car will be blessed with a whole lot of goodies that you see in the TRD Sportivo model of Fortuner. The new Fortuner might come installed with so many features and accessories that could make your regular SUV dull in front of this one. With new features and goodies, it is obvious that the price of the car will go up a bit and you will have to spend a little more than the ongoing price. Coming back to the new features in 2013 Toyota Fortuner, it will be blessed aesthetically and technologically. the chrome finished scoop cover for bonnet would add a little Bling, while chrome finishes will also be seen on the exhaust tip, door handle housing and headlamp surround. Also, the exteriors will come with door cladding, lighted scuff plate, Front grille guard, roof rack and rear bumper step guard. When you will step inside, you will find new fabric floor mat, fabric boot mat, heads-up display, drilled ABC pedals, ambient lighting for driver foot-well, washable luggage tray, rubber floor mats, window visors and more. Coming to the technical specifications, the new Toyota Fortuner will retain the 3.0 litre 4-cylinder diesel engine. The engine will be churning out about 177BHP of peak power and 343Nm of maximum torque. The engine will be coupled with five-speed manual transmission. However, there would be a variant that would feature five-speed automatic gearbox that would certainly enhance the overall droving experience for the owner. 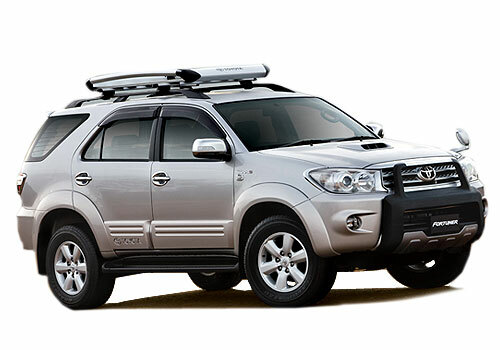 Currently, the SUV is available in both 4x2 and 4x4 options and this would be continued to the 2013 Toyota Fortuner.